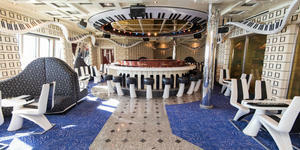 Opinions about cruising's best bars vary like the color of cocktails. One passenger's top-shelf piano lounge might be another's to-be-avoided dive. We all have our favorites: levitating lounges, pubs with delicious fish and chips, and alfresco watering holes where you can watch a spectacular sunset as you nurse a cocktail. What makes a bar stand out for us? Often, it's originality and innovation, a new twist on the ol' purveyors of gin and tonics and buckets of beer. You might find an ice bar gimmicky, but it's certainly different. 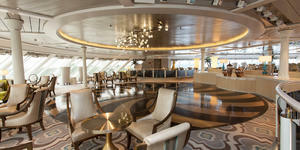 In other cases, we applaud onboard establishments for offering unique drinks or pairing food and booze; sometimes, these bars are simply places where, time and again, we've spent an enjoyable evening. So, whether you're a beer connoisseur or a wine aficionado, we invite you to enjoy our list of best bars at sea. What's Cool: Order a martini flight and try out six colorful beverages, poured from a tower of martini shakers into a pyramid of glasses. The bartenders here have watched "Cocktail" too many times, and they put on an impressive display of bottle-tossing and -twirling as they mix your drinks. An ice-topped bar and a central location add to the appeal. 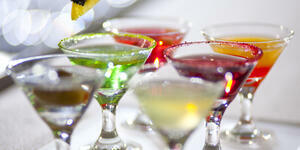 What's Cool: While not just a martini bar, Commodore Club offers the line's most extensive selection of martinis. You'll feel like a million bucks sipping yours straight up or with a twist while taking in the 270-degree views. Chairs, many tucked into windowed nooks, are deep and comfortable and, as befits Cunard, the more formal evening dress code means everyone's dressed to impress. What's Cool: Carnival's Alchemy Bar takes cocktails to the drugstore with an "olde apothecary" theme, featuring bartenders in lab coats and a dark wood bar decorated with apothecary jars. They'll write you a prescription for Passion Potions (like a Martini Seduction), Energizing Elixirs (Spicy Chipotle Pineapple Martini) or Cocktail Therapy (Curative Peach Cosmopolitan). Despite the bar's old-timey feel, menus are illuminated e-readers (on some ships). What's Cool: A mojito flight will get you in the mood to fiesta with your choice of six sweet and savory combinations, such as pineapple coconut or sriracha. Take yours out to the Waterfront if you're on the Breakaway- or Breakaway Plus-class ships; sea breezes and live music (piped in from the interior half of the bar during the evening) complement the Cuban cocktail perfectly. What's Cool: This bar on Celebrity Edge is found inside the Eden entertainment complex. The space, set up to resemble a golden spiral, houses winding walkways that provide access to a restaurant, central stage area for other-worldly performances and the bar area, which comprises a lounge, a daytime deli and, of course, the bar. The menu offers up craft cocktails; there, presentation is just as important as flavor. What's Cool: Princess' wine bar, found in the bustling Piazza area, serves up wine flights and a selection of new- and old-world vintages in a faux wine-cellar setting. (Think dim lighting and wooden barrels.) But it's more than just a bar; along with your vino, you can order sushi and tapas for a light, sophisticated meal (free with beverage purchase on select ships, not available on Grand Princess and Sapphire Princess). As you sip, don't forget to check out the performers who entertain in the Piazza. What's Cool: Although the wine bars on these ships all have different names, they offer a hefty list of wines from provinces across Italy. The bars' light leather upholstery seems, at first, counterintuitive; wine bars, after all, are generally very dark and rich in tone. But, ultimately, the decor creates an atmosphere that's open and chic. Knowledgeable sommeliers on each sailing offer tastings that include information about the various vintages, their regions and the processes that go into making the wines. The tasting fee includes a plate of tasty cheeses and meats to accompany each glass of vino. A partnership with Blend Craft Wines of California brings winemaking classes, dinners and experiences onboard, also for an additional fee. What's Cool: La Reserve isn't just an ordinary wine bar; it's a venue for wine tastings and gourmet wine-themed dinners. Tastings, developed by "Wine Spectator," might focus on wines from your cruise region or show how different types of wine glasses affect your enjoyment of the vintage. Multicourse dinners pair fine cuisine with premium wines and are a collaboration between the executive chef and the magazine_'s_wine experts. La Reserve's elegant setting, with upper-deck views, simply adds to the experience. What's Cool: It's pink. Really pink. Disney's Pink is decorated with pink Champagne bottles, pink plush chairs, pink bubble lights and pink Champagne glasses. Yet it's not overbearing; in fact, it's downright charming. Lighted glass bubbles adorn the walls, and savvy cruisers might catch a glimpse of Dumbo dancing sporadically in them. Champagne and Champagne cocktails are, of course, the drinks of choice. Champagne cocktail options include standbys like bellinis, as well as more inventive drinks that include elderberry cocktails. What's Cool: Atmosphere is everything at this cool and collected wine bar onboard select Royal Caribbean ships. Taste the bar's namesake from vineyards around the world, with some varietals exclusive to the cruise line. Onboard select ships with Jamie's Italian, a limited menu is available for a few dollars per appetizer. What's Cool: The Humidor feels like a traditional smoking room in an old British country house, where you can relax in deep, plush chairs and on couches set on rich wooden floors, accented with handsome rugs and prints on the walls. It's well ventilated, but it still retains that delicious, rich cigar aroma, which has permeated into the furniture. There's a bar adjoining it, and it has excellent waiter service. All cigar bars should be like this. What's Cool: The view from Meridian -- located on Deck 12, aft -- is spectacular, with huge windows and vast outdoor spaces that ensure passengers will never miss the passing scenery. A large granite bar runs the length of the lounge, which is decorated with lots of high-backed leather chairs and travel-themed decor. Cigars are available for purchase at the outside bar. 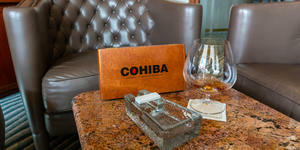 Meridian is nestled between restaurants Palo and Remy, so aficionados don't have far to go for an after-dinner stogie. What's Cool: Sprawling along the busy outdoor Boardwalk area on Symphony of the Seas, Playmakers can be an indoor or outdoor space. 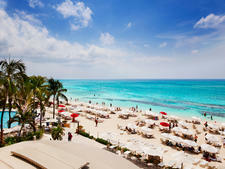 It shows a wide variety of sporting matches throughout every sailing on a multitude of large flat-screen TVs. In addition to being ground zero for all things sports onboard, Playmakers serves tons of tasty bar food. It also has loads of fun table games for families and an entire section of arcade games from Skee-Ball to racing simulators. What's Cool: Disney's association with ESPN means sports fans won't miss a game (including NFL) while sailing. The line's sports bars -- all adults-only at night -- have numerous high-definition flat-screen TVs with digital surround sound and cozy spaces that allow for quiet conversation, even when the bar is packed and the big game is on. 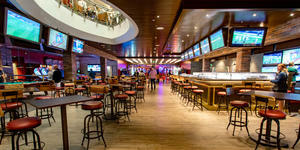 What's Cool: One reviewer described Carnival's Sports Bar as the man-cave to end all man-caves. It's chock-full of flat-screen TVs that can show individual games or combine to show a single game across several screens. The bar is stocked with a selection of beer and bar snacks. Despite the line ending its partnership with EA Sports, a handful of ships still feature the collaboration at the EA Sports Bar, where you can play free EA video games. What's Cool: Called The Sports Bar on all ships (except Magnifica, where it's known as L'Olimpiade), these venues are more than just a place to watch the game with a beer. With a relaxed and colorful atmosphere, each features a bar, a pair of mini-bowling lanes, sports memorabilia, plenty of tables and chairs in various alcoves and, of course, an astounding number of flat-screen TVs for watching live competitions. What's Cool: Cunard's Golden Lion Pub reeks of authenticity with its fine lagers, ales on tap and classic pub fare like fish 'n' chips. 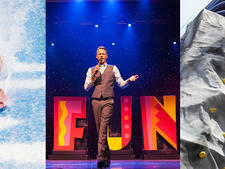 Entertainment is also pub-worthy, featuring pub quizzes, live music and sporting events on the telly. What's Cool: At O'Sheehans, passengers can bowl, throw darts and play pool or foosball before enjoying dinner and drinks. The 24-hour venue serves up complimentary breakfast and pub fare, and it's the best spot for draft beer. Miami-based Wynwood Brewing Company partnered with Norwegian to introduce its first brewpub at sea on Norwegian Escape, and while no beer is made on premises, a selection of 24 beers on tap -- including La Rubia Blonde Ale, a craft beer made exclusively by Wynwood for Escape -- accompanies 50 bottled choices and a gastropub-style menu supplied by onboard small-plate outlet Food Republic. Don't forget to take a quick pic with new friends at the onsite photo booth, which is a hangout for cruisers and crew alike. What's Cool: Eschewing the "British" in British pub is Carnival's RedFrog Pub, a Caribbean/Key West-themed space featuring chill live music, games like ring toss and table shuffleboard, and an exclusive brew on draft. Carnival's ThirstyFrog Red Ale can be ordered by the pint or by the 100-ounce beer tube. For-fee appetizers (conch fritters, roti and the like) are available at the venues on Breeze, Magic, Vista and Horizon only. Taking it to the next level on Vista, Carnival installed an onboard brewery -- a first for the industry -- that brews craft beer from tanks in full view of pub-goers. Additionally, a partnership with Tampa-based craft brewery Cigar City brings local craft beers to 13 ships sailing from Florida. 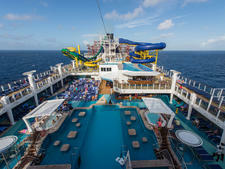 What's Cool: Carnival earns top honors in this category, with piano bars on all its ships. Though no two look the same, you can expect a nearly identical rollicking atmosphere with plenty of sing-alongs, group toasts and some adult-themed tunes after midnight. The most coveted spots are the stools surrounding the pianos, which revolve slowly so everyone gets a good view of the ivories. But arrive early to snag a choice spot; some of Carnival's pianists have nearly cult-like followings. What's Cool: Sipping is almost secondary to the sing-alongs at this popular dueling piano bar. Request songs by bringing up a slip of paper (and a tip never hurts to get it played), and sit back to watch the two pianists work their magic on the keys. Both the classics and songs currently on the radio are fair game, and depending on the crowd on any given evening, the joint can get rowdy. What's Cool: Royal Caribbean's nautical-themed Schooner Bar is a trivia basecamp that also turns into a piano bar at night. The individual pianists really affect the after-hours atmosphere; some host lively sing-alongs, complete with props, while others provide background music to a packed house of post-dinner merrymakers. If the piano player isn't playing your song, feel free to make a request. What's Cool: It levitates. Rising Tide is an Oasis-class novelty bar, evocative of a space pod, that floats up and down three decks between the Royal Promenade and the foliage-filled Central Park. 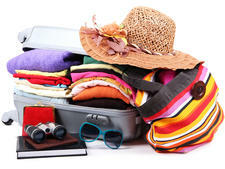 Takeoffs typically occur every 30 minutes during designated hours. The ride is about 20 minutes, but the "driver" can adjust the speed up and down. While the bar is one-of-a-kind, don't expect the same from the menu; you'll find a standard selection of cocktails and beers. What's Cool: It's not just cool, it's freezing. The air in this spine-tingler is kept at a constant 17 degrees, all the better to keep the cocktail glasses, bar and ice sculptures from getting all wishy-washy. (Yep, they're all made of ice.) Just don a parka at the door, take a deep breath and enter the enchanting little cavern with multihued ice walls mimicking the aurora borealis. You can stay in there for up to 45 minutes but trust us ... you won't. The cover charge includes a toasty, warm parka and two drinks -- all of which are made with Svedka vodka or Inniskillin ice wine. What's Cool: Robots! Makr Shakr is a robotic bartending system at Royal Caribbean's Bionic Bar that serves up cocktails to thirsty and amused customers who enter their order via a tablet. Just be specific when ordering drinks; robots are pretty literal. If you fear that witty banter has been removed from the bartender-patron relationship, watch for sly comments that sometimes appear on the waiting list screen. What's Cool: The round, UFO-esque tower in the middle of many Royal Caribbean ships houses the line's signature Viking Crown Lounge. While some are more expansive, they all offer sloping windows and great views over the outer decks and out to sea. Head there for sunset or sailaway. It's an ideal place to snuggle into a comfy couch, order a drink and watch the world go by. 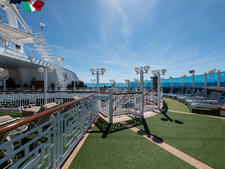 What's Cool: One of the best places for a great front-of-the-ship view at sea is the Palm Court on Crystal's two ships. The highlight of the sleekly modern lounge, located just over the bridge, is the series of 5.5-foot-high windows along the sides and the 10-foot windows toward the front, providing stunning 300-degree views. Stand right at the front when docking to see almost exactly what the captain is seeing. Aside from the view, Palm Court is a wonderfully quiet place during the day to curl up on a comfy chair with a good book. In the late afternoon and evening, the space comes alive with high tea and jazz, respectively. What's Cool: Sunset Bar's unimpeded aft views are particularly breathtaking. Celebrity paid careful attention to the scenery in designing the bar, where railings are barely noticeable and glass spans as far as the eye can see. The proximity to the ships' unique Lawn Clubs provides a breezy backyard feel and makes for the perfect location for a sunset cocktail. What's Cool: Located at the base of North Star, the ships' jewel-shaped glass pod that rises 300 feet into the air, this bar provides great views over the pool deck. Sit at the bar, or spread out on a lounger with a selection of cocktails, beer and Champagne as you plan your evening or reflect on your day in port. FOD FAQ's, or Who Are the Friends of Dorothy?